Make-ing it: Jan's oscilloscope clock was favorably reviewed in Volume 11 of Make: magazine, out on newsstands now (see page 176). Jan was unaware of the write-up until orders began pouring in attributed to the magazine. The brief review says, "This is a fantastic-looking kit, turning an oscilloscope into a clock! It uses all through-hole components, but you need to have your own oscilloscope. (Who doesn't, really?)" Fun with family: From August 6th through 11th, we spent family time in the Chateau op Wielen in northern Idaho. We had a one-night stop-over at the Coulee City Community Park along Banks Lake, which offered a beautiful sunset. The next two days/nights we stayed at Farragut State Park. Farragut is 30 miles north of Coeur d’Alene on the southern shore of Lake Pend Oreille, Idaho’s largest lake. During WWII it was the world’s second largest naval training station, and Cameron and Amy checked out the interesting museum that described the area's naval training days. We also biked, hiked some simple trails, and Sofia and Cameron played in the lake (cold!). The next two nights/days were spent at Silverwood Theme Park. Highlights included the Tremors and Timber Terror roller coasters (Cameron's favorites—see his Album), a ride on a 1915 steam train, the Boulder Beach wave pool in the water park [below], and an entertaining ice show. Jan and Amy also proved their mettle by taking the Panic Plunge; after a slow rise to the top of a 140-foot tower, the seated guests drop back to (almost) the ground at 47 mph. (Amy quickly closed her eyes, opened her mouth, and let out a scream heard 'round the park). 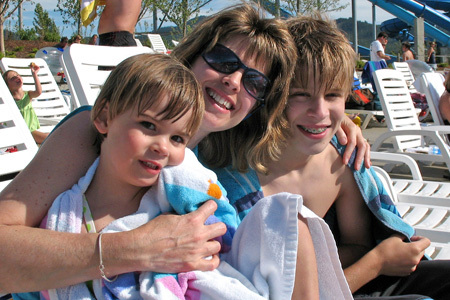 Sofia, Jan, and Cameron all loved the bumper boats, which included high-powered squirt cannons. Sofia's favorites were probably the popcorn, cotton candy, and ice cream (see Sofia's Album)! The trip ended with a true adventure, as our day-long drive home was extended by over two hours because of a blown back tire on I-90! Fortunately, we were minutes from an off-ramp just outside Spokane and were able to limp to a nearby Les Schwab. Ah, family togetherness! California cool: Amy, Jan, and Sofia (Cameron was on the Washington Coast with his dad) flew to northern California for a six-day vacation in mid-July. On the 11th when we left, Seattle hit a record-breaking 98 degrees, while we basked in a comfortable, sunny mid-80s throughout our trip. 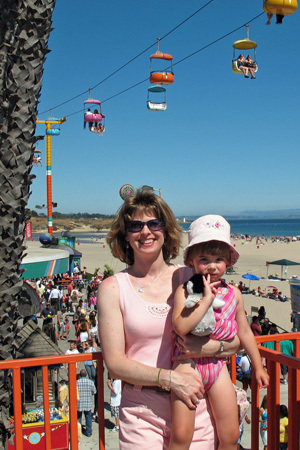 We loved the Gilroy Gardens theme park in inland Gilroy, self-proclaimed "garlic capital of the world;" we hit the beach and boardwalk in Santa Cruz [right]; and we drove up to the mountains to see some monster trees in Big Basin Redwoods Park, California's oldest state park. We also enjoyed spending time with friends Elisabeth and Evan, and Patty and Roger. Despite all the exotic sightseeing, Sofia's favorite part was probably swimming in the Ramada Inn's pool every day (see her Album). Summer slaving: Cameron began his first job on July 2nd. He's helping out at the Washington State Transportation Center (where Amy works) up to 15 hours a week doing research work, reception work, and odd jobs. Big finish: Cameron's last day of junior high was Monday, June 25th. He received the honor of class Valedictorian by completing all six semesters of junior high with a 4.0 grade point average. The family is very proud of all his effort and success. A very special party: On Sunday June 10th, we went out to dinner to celebrate a very special occasion: upon her first attempt, Sofia had spent all weekend clean and dry in big girl underwear! We called it "a poo-poo party." While at dinner (at Denny's, where Sofia loves the pancakes and bacon), Amy said, "We're having a party, Sofia. Isn't this a fun party?" Sofia, however, insisted that it was not a party. "Why? What would make it a party?" asked Amy. "Presents!" said Sofia. Can't argue with that logic.